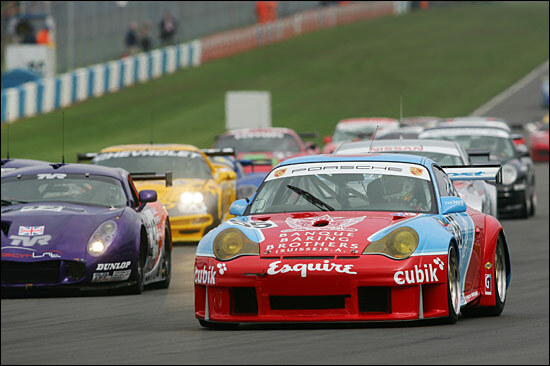 Jonathan France’s Embassy Racing arrived at Donington Park fresh from a successful Monza FIA test and ready to face the home-grown competition in the opening round of the 2005 British GT Championship. That competition was keen to take a good look at Jonathan’s new team as well, and the Yorkshireman was so proud to show just how far his team had come over the winter. The hospitality awning seemed to have grown in every possible direction, yet Jonathan did a sterling job in terms of keeping it full all weekend, entertaining sponsors new and old, as well as friends of the team. The big news is about the racing however. 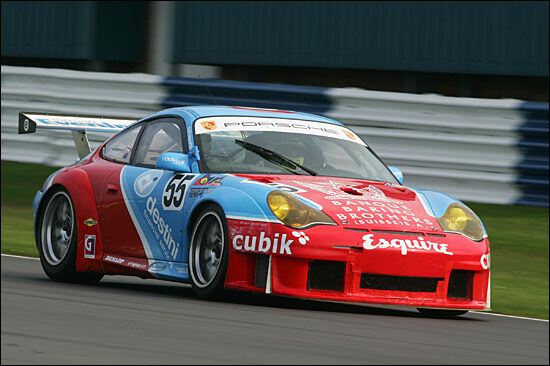 It is impossible to notice that the distinctive Corvette that the team raced in last year’s championship has been replaced by an equally striking Porsche 911 (or as some would say, “996”) GT3-RSR. 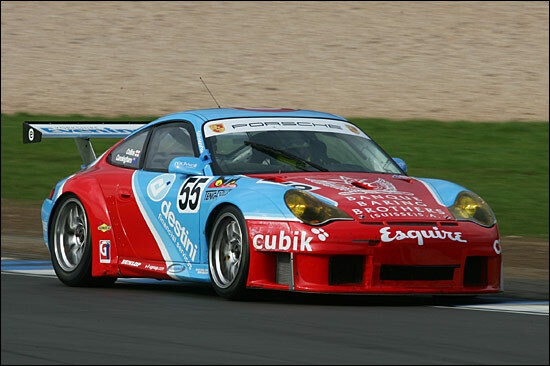 “We looked at a number of options, including the Nissan 350Z, but in the end we went the obvious route to winning a championship, because that is our aim this season.” The RSR is a tried and tested winner and this very example, the ex-Cirtek, Frank Mountain car, is no exception, having already won the Nurburgring 1000kms. Other changes to the team include a new raft of highly experienced, behind the scenes, technical people and some new additions to the team of mechanics. More on these people, their roles and influences to come as the season unfolds. The final significant addition is to the driving squad – former Ascar champion Ben Collins. 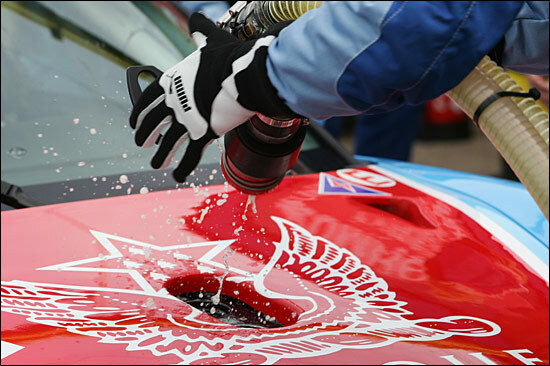 Ben drove for Embassy at the Thruxton round of the 2004 season - to great effect, giving Embassy its most successful race weekend to date. No wonder Jonathan was so keen to secure his services for the whole 2005 season, alongside the other Embassy Galactico – Neil Cunningham. With the scene set, a relaxed Jonathan France found himself contemplating the start of the season, on a cold and hazy Saturday morning. “We had two days to work at a time in Italy at the FIA test, but today we only have an hour and ten minutes,” was a fair summary. 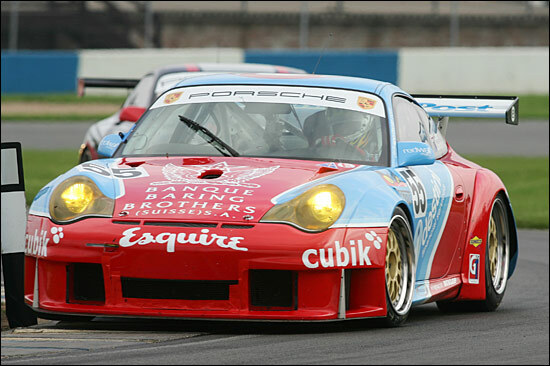 The immaculate Porsche rolled out onto the pit apron early in the session, and Ben Collins tried to make the most of the 70 minutes available by getting straight down to the kind of fast lappery the team expects. After just four laps he was sitting pretty at the top of the times, whittling his best down to a 1:10.815. With only fifteen minutes of the session (season) gone, it was immediately obvious how tough the next seven months or so will be for everyone in the GT2 class, but fortunately France’s team was right up there amongst the likely title protagonists – Scuderia Ecosse, LNT and Eurotech confirming their status as the other pre-season favourites. Andrew Kirkaldy, driving once again for Scuderia Ecosse, set the pace with a 1:07.623. The pace of this combination would be a feature of the whole weekend. Embassy’s precious time became ever more so after a red-flag paused proceedings, with just 26 minutes gone, Ben having now posted a 1:09.604. On the restart, the striking blue and red Porsche seemed to cross the line rather too slowly on its first pass, and was that a hint of hazy smoke from the rear? Indeed, the car crawled around Redgate and moments later ground to a halt at the side of the track, forcing the organisers to throw another red flag. That was to be the end of the practice session for Embassy, the team facing the ignominy of having the car delivered to the wrong end of the pitlane, on the back of a truck. A broken driveshaft seemed a cruel introduction to Porsche ownership. As the mechanics installed themselves under the car and began the disassembly, the session resumed. As the garage floor filled with more and more hot Porsche components, it was clear that Embassy was not in a position to fight back as the times began to tumble: still being sixth at the end session was hardly a disaster. Ben brought the car in with a best of 1:09.155 under his belt and handed over to Neil for the last eight minutes. “I had the race rubber on, so I couldn’t do too much on them,” explained the Kiwi. 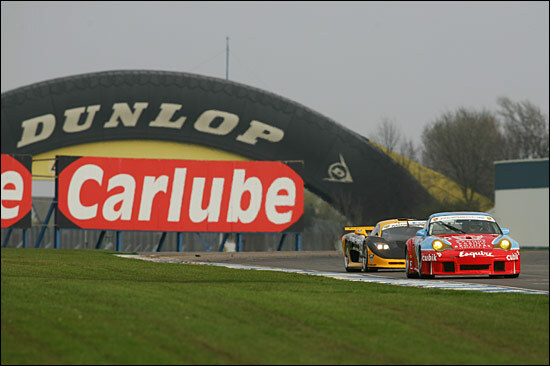 Hence Embassy dropped a few places to sixth, with late charges from both LNT TVRs and Tim Mullen in the second GT2 Ferrari. There was an evident air of disappointment around the Embassy camp. Any possible (unlikely) complacency within the team had certainly been wiped away, but there was room for optimism. “If I’d had a clear lap I think there is half a second in the car, but at least we know we have a car with a good race pace, even if we are running out of time to fine tune it. It’s disappointing when you don’t get what you set out for, but we’ve got two hours to do that tomorrow,” was Ben’s summary. And so to race day. The strain on the driveshaft appeared to have been caused by a broken engine mount, possibly dating back to Monza, and the team had pulled together on Saturday evening to carry out a precautionary engine change, to make sure everything was in perfect alignment ready for the race. Jonathan had a more optimistic perspective on Saturday’s events, having slept on that sixth place qualification. There were no issues for the team in the warm-up, and then it was just a long wait (and cool down) for the afternoon race. It was a great sight to see such a fine looking collection of GT cars finally assembled on the grid. A trolley of wet and intermediate tyres was wheeled alongside the car in case the grey skies turned any more menacing, but that was as far as any thoughts of rain got for the day. With the grid cleared of personnel and VIPs, sixth place suddenly seemed very close to the front of the pack. 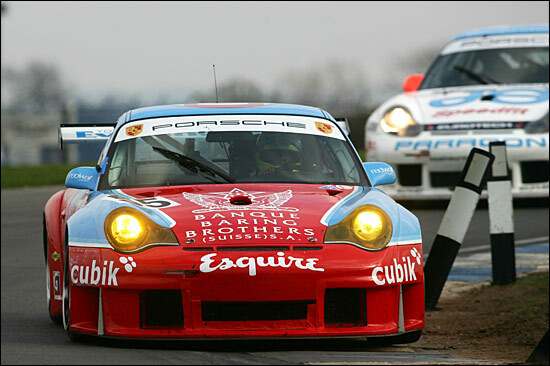 Besides, having a few cars ahead didn’t upset Neil and Ben last time they raced together at Thruxton, when the duo took the 2004 Corvette from the back of the grid to that best-ever Embassy second place. As expected, Kirkaldy was trying to stretch an early lead as far as he could and at Donington at least, the combination of Ferrari, Kirkaldy and Kinch was unstoppable. Six laps in, it looked like only Embassy could have challenged for the lead as Kirkaldy and Collins both began lapping the backmarkers. Ben was having to do all he could to chase the Ferrari though and attracted the attention of Race Control – he wouldn’t be alone though, it seemed all a driver had to do was flatten a blade of grass on the inside of a kerb to be welcomed by a black and white flag next time they crossed the stripe. For once it was Neil who would have most of the running in a session: with an hour and five minutes to go, Embassy was the first of the significant teams to pit for the driver change. “We had a bit of a lengthy stop with a tyre change, but it did seem that the misfire was cured,” said Neil. “The way he blasted out of the pits it was obvious the misfire had gone,” confirmed Ben. Two hours at Donington was always going to be a baptism of fire for Embassy Racing, but now they have the direction to make big strides in France, for round 2 at Magny-Cours. 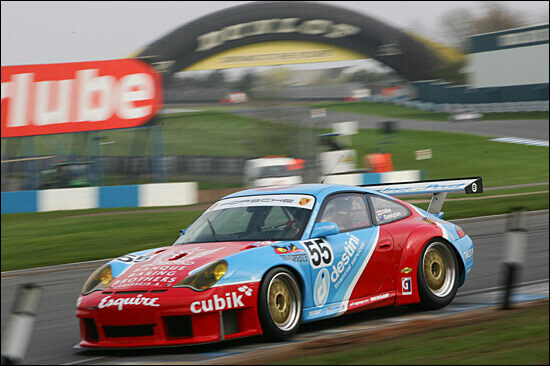 Embassy Race Radio was a much-appreciated success story for those not at Donington Park.